The Multi MIDI Editor lets you work with multiple tracks in a single editor. It can be used to work on arrangements for string or woodwind sections etc. 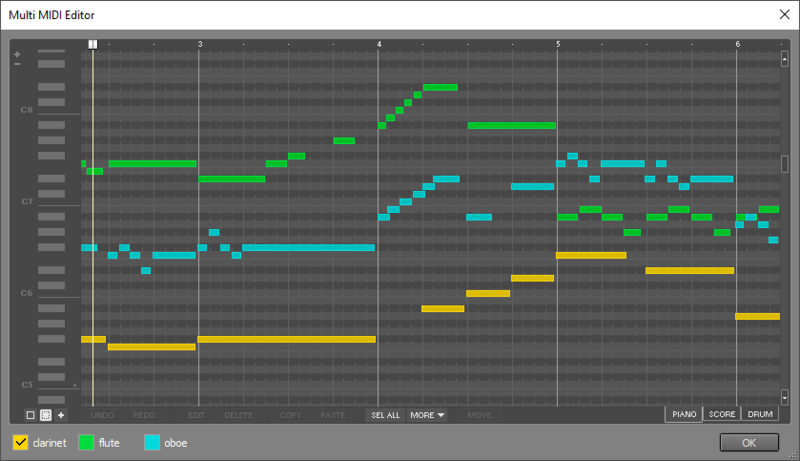 The Multi MIDI Editor shows and affects all MIDI tracks that have their editor opened. 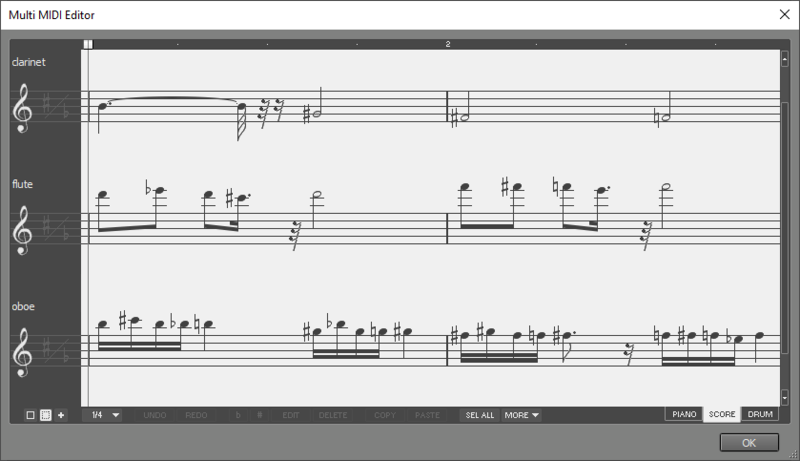 If you use suitable colors for your instrument groups you can open a group in the Multi MIDI Editor quickly by rightclicking a track's Edit button and choosing Open same color MIDI tracks in Multi MIDI Editor. The colored buttons at the bottom represent the tracks that are visible in the editor. The active one is larger and its text is bold. Any new notes you add will be in the active track. Selected notes can be moved to the active track using the Move button. In case of overlapping notes the active track will appear in front of the others. Each track gets its own staff (or a system of both bass and treble staffs). Selected notes can be moved to another staff using drag-and-drop. The colored buttons at the bottom only serve to show the names of the tracks. The drum instruments appear in the same order, and the notes appear in the corresponding colors. The Drum Instrument Selector, which appears on clicking the NEW INST button lists the instruments available in all the track's MIDI instruments. The track numbers, as they appear on the colored buttons, appear in the selector as well. Edits in a single instrument are not tweakable, unlike a track's drum editor.